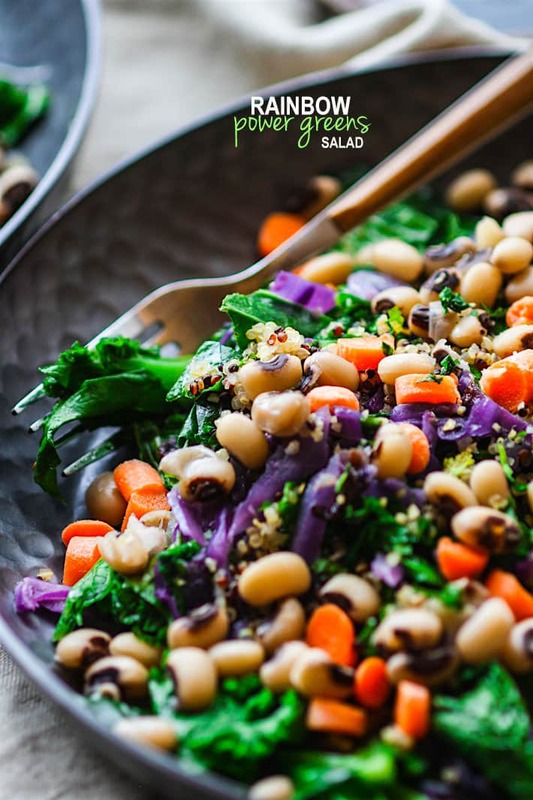 Vegan Rainbow Power Greens Salad with Black Eyed Peas. 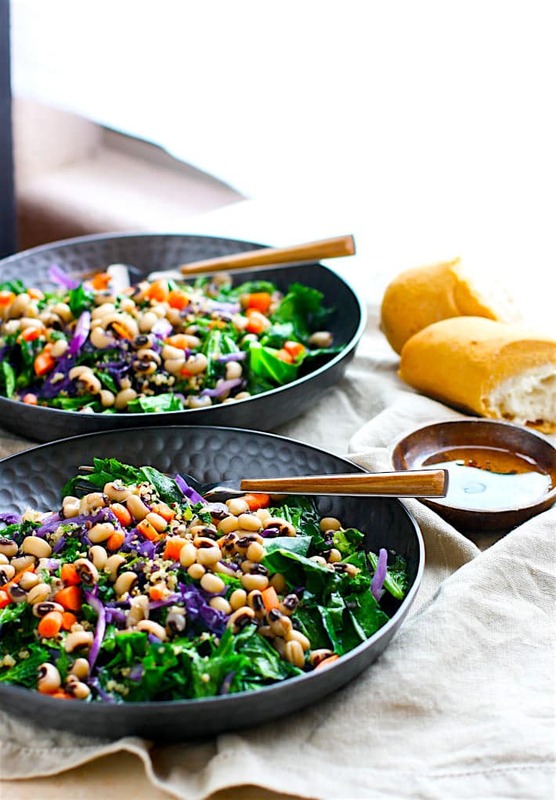 A healthy gluten free power greens salad packed with lucky black eyed peas and super nutrients. A great way to start off the new year and get back on track with clean eating. Easy to make and full of flavor! When I was younger, I thought by 2016 we’d all be like the Jetsons. You know, flying cars, living in space, futuristic clothing. Come on now, didn’t you? Needless to say, life is not like the Jetsons and I’m still waiting on my flying car so I can “jet” off to a desert island for a tan and some R&R. Ya, that might take a lot of luck. 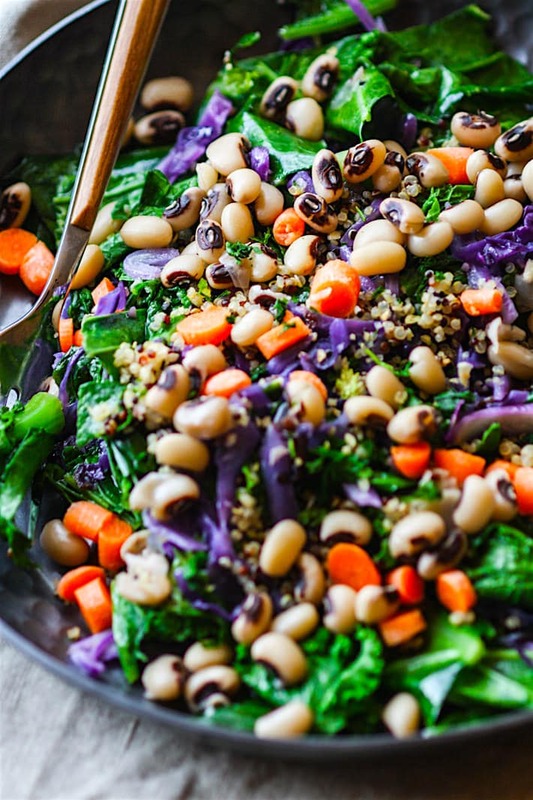 Luck or a lot of Rainbow power greens salad with black eyed peas! Are you confused yet? Don’t worry, I’ll explain. You’ll like this! Friday is a New Year. I mean the big 2016!!! And with the NEW YEAR comes Lucky food. Black Eyed Peas and Collard Greens (and many other types of power greens) are some of the foods that are meant to bring you luck in the new year. And LUCKY for you, I made a dish that has both peas and power greens and is SUPER DUPER HEALTHY! Which means I just tripled your luck factor. At least that’s what I am going to believe. Let’s talk about this though. 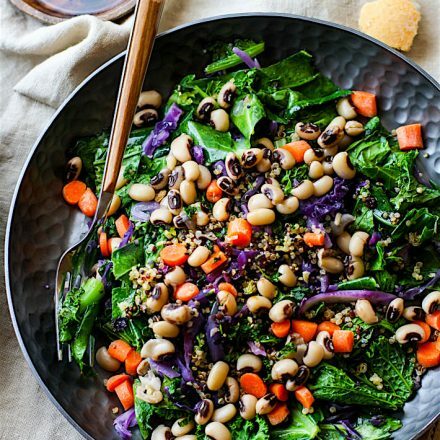 What makes this rainbow power greens salad with black eyed peas so lucky and healthy? 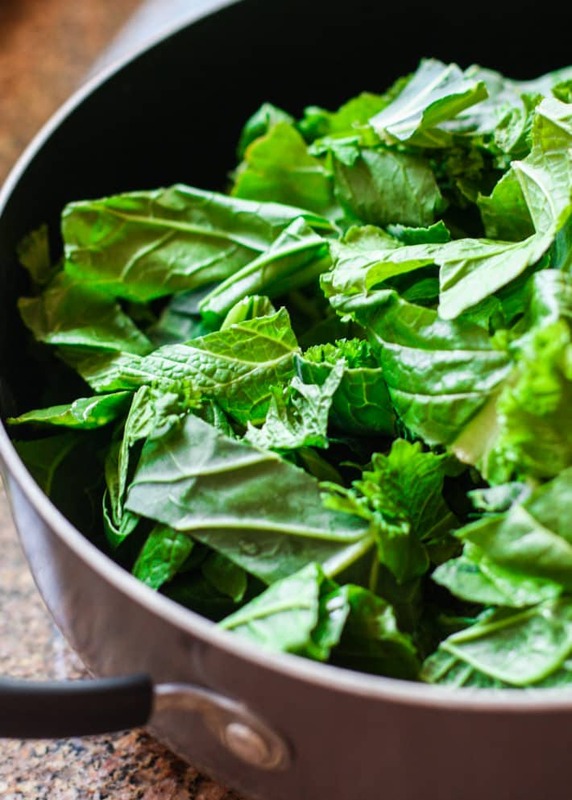 Greens (collard greens or cabbage) – Well, for one they will definitely get your body a RICH amount of vitamin K. These green also support our detox and anti-inflammatory systems. YAY! So needed after holidays. But there’s more, these power greens are also said to represent richness, money, etc. If that’s the case, I’m eating BUCKETS EACH DAY! Black Eyed Peas – A southern food, that’s for sure. Black eyed peas are high in fiber, iron, and have a good source in zinc. ALL Lovely when supporting our immunity! Now, about the luck. Black eyed peas are said symbolize “good things to come: the promise of germination when planted!” Oh lord have mercy, you better believe we are eating our peas. In fact, I made a HUGE POT and we are going to eat them all! Just not one in sitting. That might backfire, literally. Okay friends, you know the health perks and the New Year’s luck “perks.” Let’s put it all together and get to eatin! 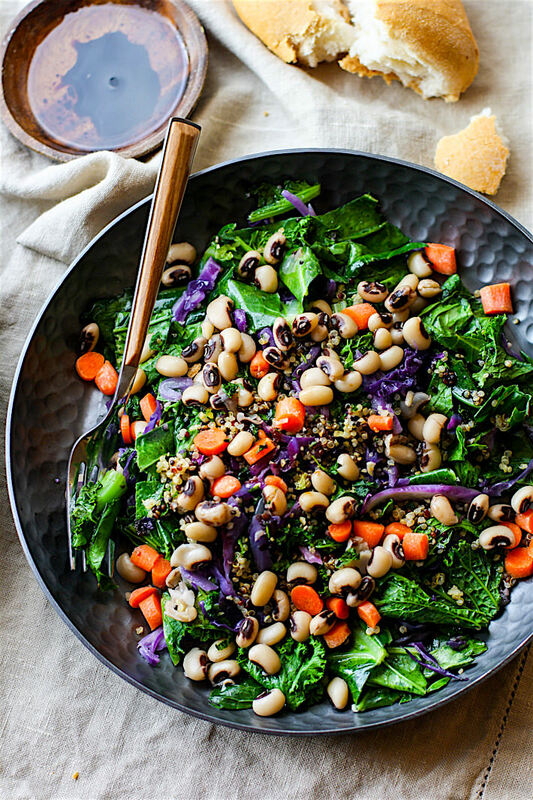 Who’s ready for healthy, delicious, lucky, RAINBOW POWER GREENS SALAD with black eyed peas? If you want to cook peas from scratch. First place a 16oz bag of peas in a pot and cover with water and 1 tbsp apple cider vinegar. 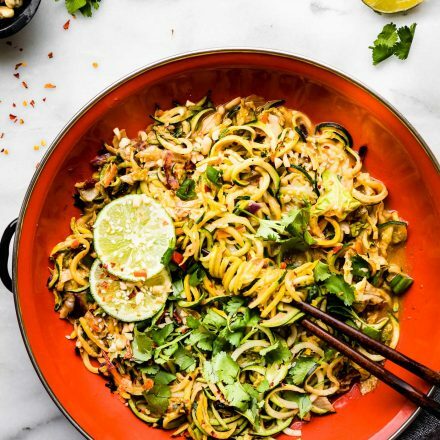 MORE healthy lucky foods and recipes you should eat in the New Year! P.S this salad may be a “rainbow“ of colors, but it’s title is also metaphoric. Um, a rainbow. It’s a sign of luck. And at the other side you can find a pot of gold. See… I’m clever. 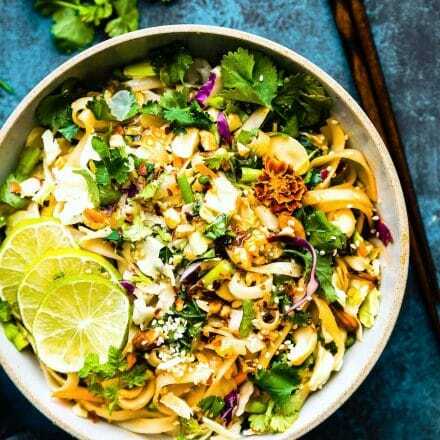 A #Healthy dish that will bring LUCK! 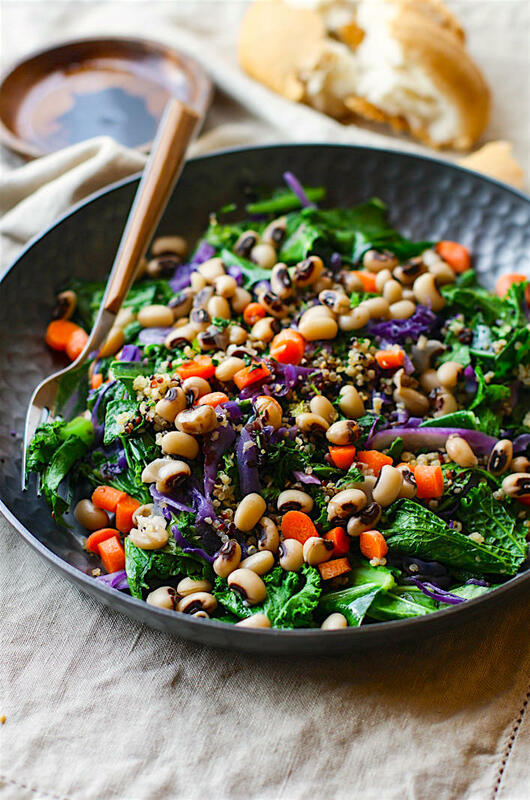 #Vegan Rainbow Power Greens Salad with Black Eyed Peas. Happy NEW YEAR’S and see you in 2016!! Favorite lucky food to eat on New Years? haha me too! i wonder what’s next! Ha! I thought the same thing about the us being the Jetson’s by now. Guess while we wait we’ll just have to keep making good food. I’ve never had black eyed peas. Maybe I should start eating buckets of them so my luck will change? Would you believe it if I told you I’ve never had black eyed peas? But if they’re supposedly good luck them I should probably start eating them….. yesterday. PS I want those bowls. food twin, what? you haven’t? get some peas! and the bowls are target. they have gold too…. swoon! 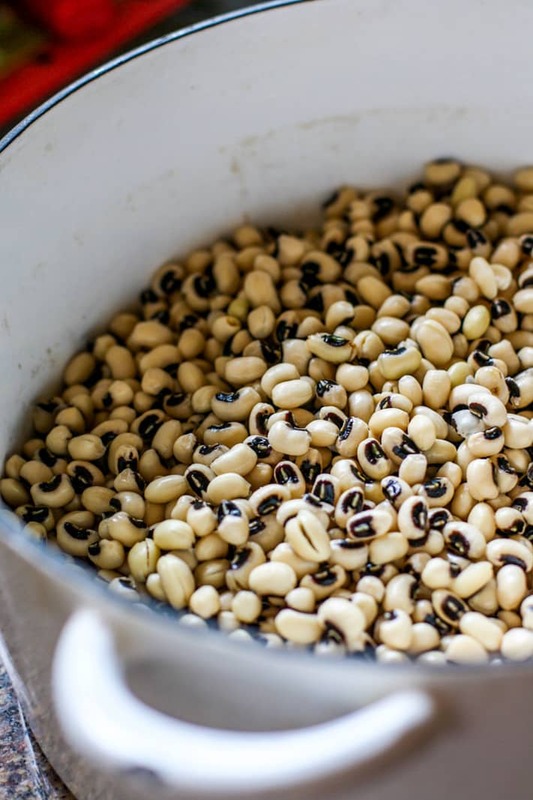 You must be a true southern gal if you know to serve greens and black-eyed peas on New Year’s! I love your healthy twist on the classic. Looks delicious! Have a wonderful holiday, my friend! yep, true southerner for sure! I’m hungry too! This salad looks so tasty. I honestly haven’t eating black eyed peas very much, but we had a Texas Caviar for Christmas and now all I want are black eyed peas! oh love texas caviar! come to texas and let’s it! This is so beautiful and colorful! I can’t deny a multitude of veggies in my salad! YUM! you know it! bright colors make it even better! I am a weird Southerner. I don’t care for black eyed peas, grits, or cooking with Coca Cola (though I love me a diet coke). But the rest of it? sign me up! And at this point, I would eat all of the above if it would heal my damn sacrum! i’ll eat your grits, and you can have more diet coke. Deal? Ohhhh the Jetsons….I LOVED that show! All of a sudden, I’m craving a huge couch sesh with The Jetsons on repeat along with uuuuuge amounts of this power salad. I love how vibrant and healthful this is….and all them black eyed peas for luck in the New Year? Perfection! yes, let’s have a jetson’s marathon and black eyed pea bowls! Well that looks colorful, healthy, and delicious! 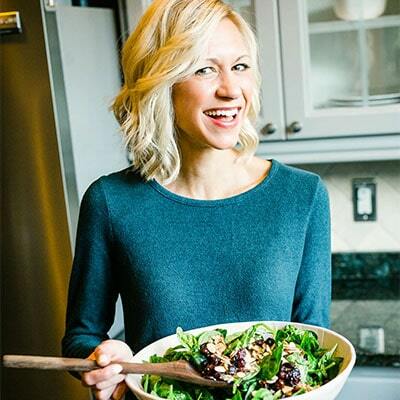 I am loving this healthy take on greens and black eyed peas Lindsay! 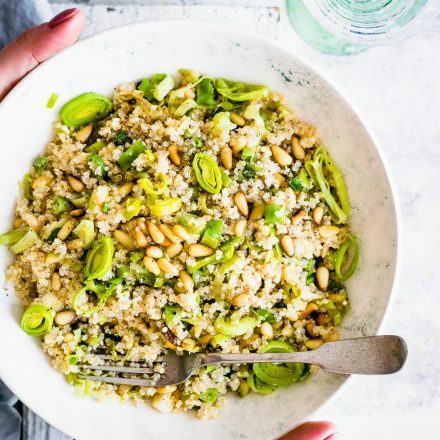 I do the whole greens and black eyed peas dealio but never thought to add quinoa to it – am gonna try this this year – maybe with some bacon in it – though that will make it non-vegan. and why i love you! bacon! yes! Love all those greens! 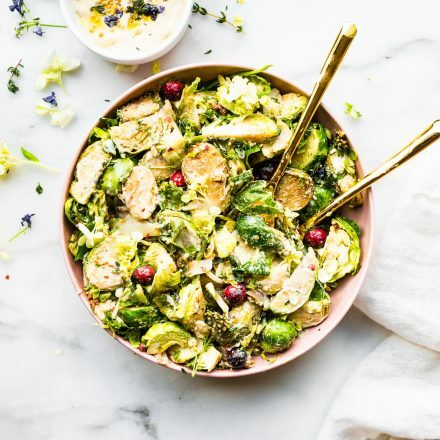 After the holidays I’ve been craving salads big-time! I’ve never had black-eyes peas before but I think I need to try them. oh friend, i think YOU’D LOVE THEM!!! I’m making a black eyed pea dish for Foodie Friday 🙂 it involves coconut rice woohoo! yeah i have heard about black eyed peas being lucky for NYE. I made black eyed peas dip few years ago…love this rainbow salad!!!! oh i need to try this dip! YUM! Blacked eyed peas and leafy greens! My NY’s foods every year!!! Although I think they could do a better job at bringing me luck 😛 Hahaha! Here’s to a LOT of luck in the new year! And a lot more salads – lord knows I need it after this month. LOL! 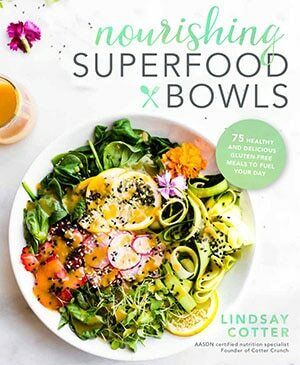 This is such a beautiful, colorful way to kick off a healthy and lucky New Year! I’m actually craving healthy foods…waaaaay too much overindulgence this holiday. Happy New Year, Lindsay! happy new year friend!! and come over some salad, ok??! LET’S EAT ALL THE PEAS!!!! haha . lucky ladies, right? I SO NEED LUCK! Send the whole pot this way or your extras! HUGS!!! I hope this isn’t a totally stupid question, but does “oil” mean olive oil or a different oil? Would you just serve the salad with some olive oil drizzled on top? I’d love to make this, but I don’t want to do it with the wrong ingredients! never a stupid question here. The oil I used to sautee the greens and onion avocado. The oil on top with olive oil. You can use olive oil for both. Keep me posted! I need more black eyed peas in my life. Oh this salad is seriously gorgeous! I will take all the luck I can get if it is this delicious! Hi! looks yummy, just wondering how much cabbage is supposed to be used? It is in the instructions, but not the ingredient list. Thanks!